Panic gripped the Barwala area following the deaths of 5000 chickens in a poultry farm located in Kami village near here this morning. With the bird flu scare subsiding, the prices of poultry have again started rising. On Thursday, the dressed broiler was selling between Rs 75 a kg and Rs 85 a kg. 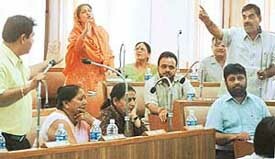 The issue of securing 20 MGD water in the fourth phase of Kajauli waterworks led to heated arguments between the Opposition and the ruling Congress councillors during the General House meeting of the Chandigarh Municipal Corporation here today. Demolitions usually spark off protests. 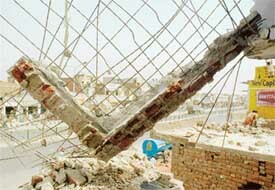 However, the ongoing demolitions in the township to make way for the four-laning of the 35-km "killer stretch" of Zirakpur-Ambala are unique in the sense that they seemed to be having owners' tacit approval. It is a classic case of “all that glitters is not gold”. A city-based girl learned this lesson only after being duped by an already married man, the father of three-year-old child, who married her by flaunting his wealth. The bluff came to light when she made a phone call to his village after he did not turn up for some days and the phone was answered by his first wife. Mystery shrouds the death of 32-year-old Jasbir Singh, a mechanic, whose decomposed body was recovered on last night in his rented accommodation in Sector 34, here. To clear the extra rush of passengers during the summer holiday, the Northern Railway has decided to run 10 special trains with 354 trips to various destinations. The special trains will run till the first week of July. Kaavya Vishwanathan’s literary fortunes have dwindled too fast. From honour to disgrace, this Harvard graduate has seen too much life in too little time. And she has mostly seen the unsavoury bit — courtesy the games she played with readers. The Confederation of Indian Industry (CII) has taken a clear and unambiguous stand on the issue of reservation as Indian Industry is opposed to reservation in any manner, but would be more than willing to engage affirmative action. The IMA, Chandigarh branch, yesterday strongly criticised the police action against peacefully protesting medical students in Delhi. While saying that Mandal Commission aftermath should not be repeated, the members said reservations in higher studies and life- saving professions like medicine was a highly retrogressive step for the growth of country’s economy. Decks have been cleared for establishing an NCC Complex in Chandigarh, with the UT Home Secretary issuing necessary directions in this regard to the departments concerned. The clear stand by a company setting up a garbage processing unit in the Union Territory not to take any slaughter house waste in the treatment process has prompted the Municipal Corporation to come up with a bio-gas plant. The Chandigarh Administration is looking for suitable land to rehabilitate around 20,000 cattle heads being reared in illegal dairies across 18 villages. These villages do not come under the jurisdiction of the Chandigarh Municipal Corporation. Certain roads in the town will be widened to ensure smooth flow of traffic while the parks will be handed over to the Municipal Council for maintenance. This was stated by Mr Bir Devinder Singh, Kharar MLA, while addressing a press conference here this evening. A resident of Phase X, Mohali, is a harassed person. For the past about two years, Mr N.S. Bal has been at the receiving end of the telemarketing agents of a leading private bank. The Chandigarh Lalit Kala Akademi yesterday announced its annual awards in the categories of painting, graphics, sculpture, photography and drawings. Among the winners in various categories are — Anand Shinde (painting), Sanjay Kumar (graphics), S.M. Dhami (photography), Gauri Sharma (drawing), and no award in sculpture category. The bhog of the well– known Punjabi film actor, Sangeeta Mehta, took place in the Sanatan Dharam Mandir in Phase IX here today. Sangeeta Mehta had died on April 17 in the PGI, Chandigarh, after a prolonged illness. The demolition squad of the Estate Office today cleared encroachments on about 10.50 acre in Raipur Kalan village here today. The land has been handed over to the Municipal Corporation for setting up a gaushala. Two persons were arrested on the charges of impersonation after they were caught red-handed by the Railway Recruitment Board officials here, during the verification of the documents. It was alleged that the one of the accused had send someone else to appear for him in an examination conducted by the board last year in September while the other accused had arranged the examinee for the original candidate. Close on the heels of a burglary in a showroom of an electronic goods located in the Sector 11 market, burglars struck at a house located in Sector 9 and decamped with cash and other valuable worth thousands of rupees. 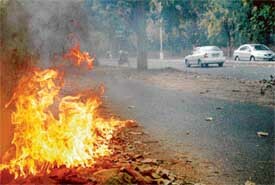 Thieves decamped with goods worth about Rs 1. 5 lakh from a factory in the Phase VII industrial area here last night . According to reports, thieves entered the building by breaking the rear wall and decamped with tractor parts and parts of some machines. A 13–year–old boy was killed after he was hit by a Punjab Roadways bus in Phase VIII here today . According to the police, Ravinder Singh, who worked as a hawker, was coming from the direction of Phase XI and the bus was going towards the bus stand when the accident took place. Around 9,000 students from the city and nearby areas are getting ready to crack the AIEEE examination scheduled to be held on April 30. With the option to choose from among more than 30 engineering courses, including architecture, through AIEEE, 17 examination centres have been set up in the city. Too little too late — nothing describes the response of Punjab Engineering College towards the memory of its most illustrious alumnus Kalpana Chawla more aptly than this. 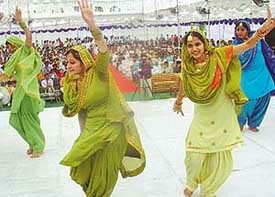 The campus of Chandigarh Group of Colleges, Landran, vibrated today with music, laughter and dance on the occasion was the annual function of the college—Ojas-2006. Arshdeep Singh was selected Mr Gabru and Kriti Kamboj as Ms Mutiyar in this function. There is a need for developing a child’s learning skills and make him into an independent learner. Classroom learning should be made more interactive and children should also learn from each other . As an initiative taken to help the needy and talented children receive proper education, 30 students of Government High School, Mauli Jagran, were today enrolled under the Chinmaya Mission. 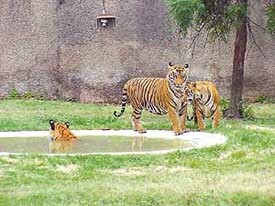 Students of many schools in the city have stepped in to save the tiger and the vulture from extinction. Nearly 700 students from various schools, including St Kabir Public School, Sector 26, SD High School, Sector 24, Government Senior Secondary School, Mani Majra, CL Aggarwal DAV Model School, Sector 7, St John’s High School, Sector 26, and Yadavindra Public School, Mohali, have appealed to the Prime Minister to take steps to protect these endangered creatures. 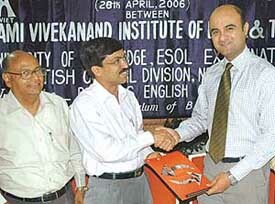 In a step that would go a long way in improving the communication skills of the students, the Swami Vivekanand Institute of Engineering and Technology (SVIET) today signed an MoU with the British Council Division (BCD), New Delhi, for the University of Cambridge's Business English Certificate (BEC). 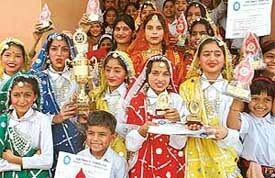 An impressive culture programme presented by students marked the annual day and prize distribution function of Kendriya Vidyalaya No 1, Chandimandir, near here today. Students of Kendriya Vidyalaya No. 1, Chandimandir, show their prizes at the annual day and prize distribution function in Chandimandir on Friday. The first-ever three-day training course for liaison officers of 10 local Colleges to work with the University Employment Information and Guidance Bureau, Panjab University, concluded at the ICSSR Complex here today. The District Education Officer, Chandigarh, Mr R.S. Goraya retired today. Mr Goraya had joined as a Lecturer in Chemistry in a UT school on October 5, 1971. He was promoted as Principal in the same department on July 23, 1990 in the Government Senior Secondary School, Karsan. As part of its annual summer activities, the Lawrence School, Sanawar, on Tuesday announced the annual school camps 2006, including a series of team-oriented adventure activities. The Punjab and Haryana High Court Bar Association today organised a get together to formally bid farewell to Mr Justice D.K. Jain, Judge, Supreme Court of India. Before his elevation to the apex court, Mr Justice Jain was the Chief Justice of the Punjab and Haryana High Court. Vikas Dhawan, son of former Civil Aviation Minister and president of the Chandigarh Vikas Manch (CVM), Mr Harmohan Dhawan, was today acquitted by a local court in eight year-old case of hit and run. The first ever three-day all-India Bengali drama competition started with two captivating presentations of Bengali plays by the local teams today at the Tagore Theatre. The event organised by the Kalibari Chandigarh in association with the BSS promises a bonanza of Bengali drama to the art lovers in the city with five teams from Delhi, one from Shimla besides two from the city. Fire, heat and dryness — it is one deadly concoction our respiratory systems could do without as summer arrives in all its fury. Burning of leaves in the open, the complete absence of humidity in the air and the rising temperature, all contribute to aggravate problems related asthma, chronic bronchitis, respiratory infections etc sometimes even leading to pneumonia. As many as 200 volunteers, including senior officers and women staff, donated blood at a camp organised by the Central Reserve Police Force at its location in Hallomajra here today. CRPF personnel donate blood at a camp organised at the CRPF Centre in Hallomajra in Chandigarh on Friday. “We had promised our grandpa to fetch gold medals, and we did it,” echoed Chaitanya Handa and Dhruv Handa, brothers who were elated over their success. Chaitanya, 4, stole the show with two consecutive wins in the under-4 category in the two-day St Xavier’s Skating Carnival held at Skating Rink, Sector 10. His elder brother, Dhruv, is delighted to clinch a gold in the All-India Open Table Soccer Championship held at Saffron City School, Fatehgarh Sahib. The Coaching Centre-23 (CC) thrashed the Sacred Heart-26 team 6-0 in the girls' category while the St Baptist School-45 beat the Government Model Senior Secondary School, Sector 30, 0-1 in the boys' group on the inaugural day of the UT State Handball championship today. Chandigarh has put up a target of 323 runs before Jalandhar in the finals of the ongoing Punjab State Inter-District Under-15 Tournament For Sushil Bali Memorial Trophy being played at PCA Stadium.